Those of you that have been scrapbooking for awhile will probably remember Digital Scrapbooking Magazine that was part of the CK Media umbrella. Sadly, this magazine dedicated to digital & hybrid scrapbookers ceased publication with the downturn of the economy (I think around the same time that Simple Scrapbooks ceased publication). However, CK Media has decided to give DSM a bit of a revival tour through this 'best of' issue. So, if you were a faithful subscriber and you still have all their issues, this may not be a purchase for you. But, if you missed this very resourceful magazine or are looking for a way to condense the best tutorials into a more compact edition, you should most certainly consider purchasing this issue! This issue starts off with more basic tutorials such as organizing your digital supplies and progresses in difficulty as you move through the issue. If you'd like to see more, here's a great sneak peak to give you an idea of the wonderful stuff you'll find inside! 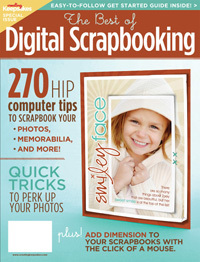 The Best of Digital Scrapbooking issue is now available for purchase at $14.99 at the CK store. I do have one copy to give away to one lucky reader. Simply leave a comment to this post answering the following question by 5 p.m. on Tuesday, January 18th, 2011 and you'll be entered for your chance to win! Do you consider yourself a traditional, digital or hybrid scrapper? Random.org will select and I will announce the winning comment on Wednesday.